Although most residents have finally been able to enjoy summer temperatures for a while in Newfoundland, the eastern parts of the province will have some rainfall and gusty winds to contend with this week. Hurricane Chris is projected to pass over or near the region Thursday afternoon or evening, and will weaken to a post-tropical storm. Environment Canada has issued rainfall and wind warnings for parts of southeastern Newfoundland. Heavy rain, strong winds, significant waves and storm surges could hit coastal areas of the island on Thursday. 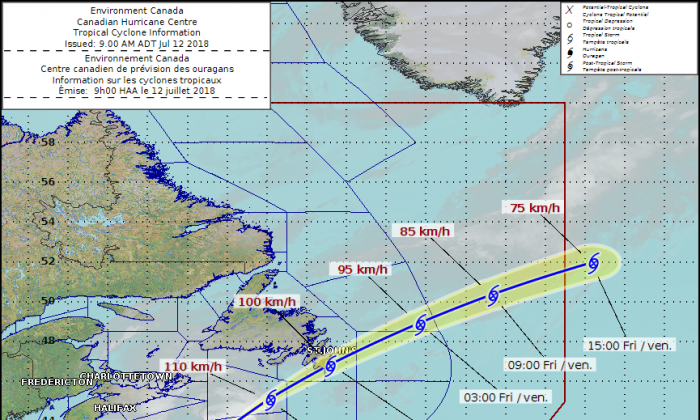 Up to 80 millimetres of rain is now forecast for most of southeastern Newfoundland, and wind gusts up to 100 kilometres an hour are expected as the storm passes by on Thursday evening. The wind gusts are projected to impact the capital St. John’s as well. “High waves, pounding surf and storm surge will be a consideration for parts of southern Newfoundland Thursday night,” Environment Canada said in a statement. Swells of 6 to 8 metres are possible in southern Avalon Peninsula, and 3 to 5 metres in southern-facing coastlines of Newfoundland. The Atlantic Coast of Nova Scotia could see swells of 2 to 3 metres later on Thursday. Ahead of the storm, ExxonMobil removed some workers from offshore oil platforms off the Atlantic coast, CBC reported. Chris is the second hurricane of the 2018 Atlantic season after Hurricane Beryl.